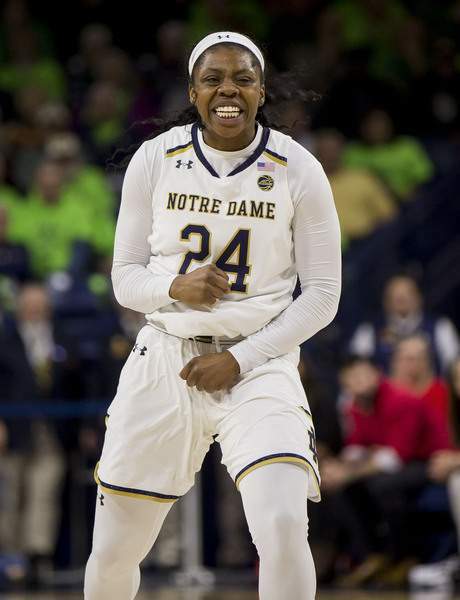 Associated Press Notre Dame’s Arike Ogunbowale scored 26 of her 30 points in the second half to help the top-ranked Irish avoid being knocked out of the top spot by No. 2 Louisville on Thursday night. SOUTH BEND – The No. 1 ranking will remain safely in South Bend. No. 2 Louisville led throughout the first half Thursday in its bid to ascend to the top spot for the first time in program history, but top-ranked Notre Dame turned the game around thanks to 26 second-half points from Arike Ogunbowale to win 82-68 in front of an announced crowd of 9,149 at Purcell Pavilion. Ogunbowale finished with 30 points on 8-of-15 shooting and Jessica Shepard added seven points and a game-high 15 rebounds as the Irish (15-1, 3-0 ACC) avenged a pair of losses to the Cardinals (14-1, 2-1) last season. Louisville stayed close in the fourth quarter and cut what had been a 10-point lead to just two twice in the final three minutes. Both times, Ogunbowale responded, first hitting a fadeaway jumper out of a timeout, then burying a dagger 3-pointer with a hand in her face with 40 seconds left to make it a seven-point advantage and ice the game. For the Irish, it was the eighth time in program history they have played in a No. 1 vs. No. 2 matchup, but only their second win in such games. Asked what was the best part of coaching in such a high-profile matchup, coach Muffet McGraw had a ready answer. “Not playing Connecticut I think,” she said, smiling. “It's just great for the ACC to see we have such a strong conference. I think it's great nationally, kids turn on the TV, see one versus two, so I thought that was great. That previous top-two matchup was in December against Connecticut, when the Irish lost 89-71. They trailed through much of the early part of Friday's game, as well, shooting 14 percent in the second quarter and falling behind by as many as seven. Ogunbowale, who averages 22 points, had just four at halftime. Throughout the first half, however, Louisville couldn't avoid contact, getting called for 15 fouls and putting several players in foul trouble. In the third quarter, that bit the Cardinals, who struggled to defend without drawing whistles. Notre Dame went in front and pushed its lead to 10 when Ogunbowale hit another 3-pointer from the top of the key at the buzzer. 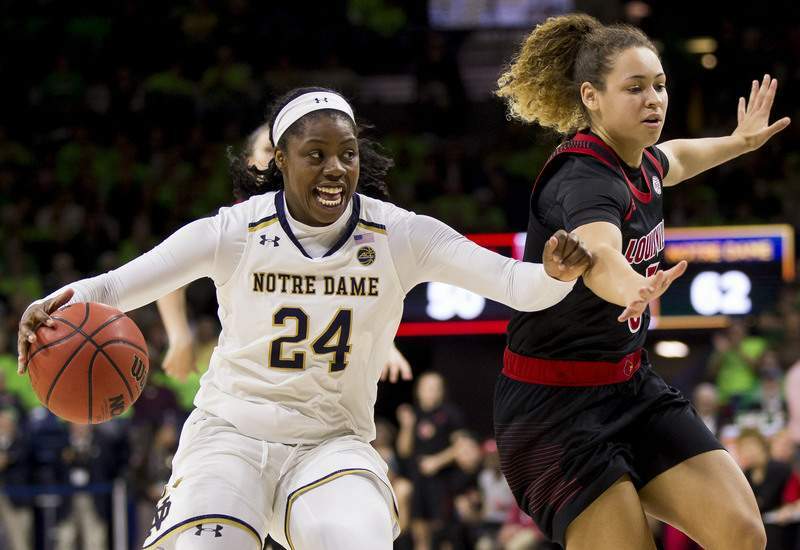 Notre Dame shot 30 percent in the first half, but 59 percent in the second half as the fouls piled up and the Cardinals became tentative on defense. Guard Asia Durr led Louisville with 29 points, 19 of which came in the first half.